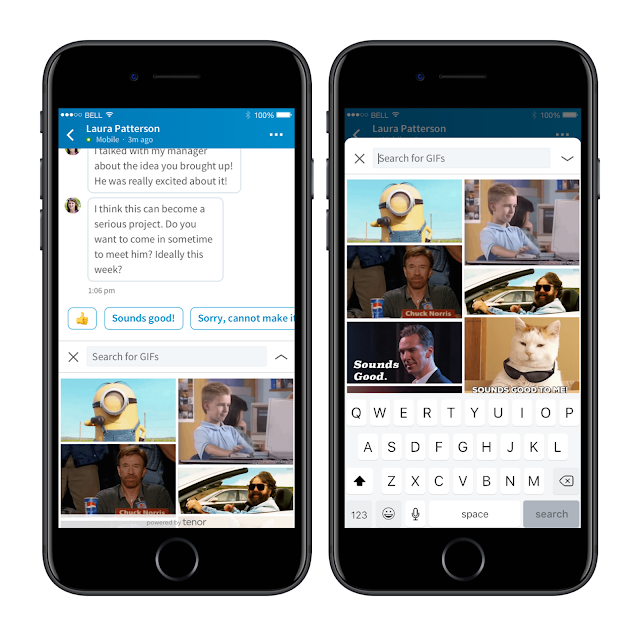 While Google acquired the GIF platform, Tenor in March to improve image search, the company has now deployed the keyboard tool exclusively to power GIF searches in LinkedIn messaging. Tenor GIF search tool is already powering the keyboard on a number of different social platforms, including Facebook Messenger. Google's acquisition of the versatile messaging tool, is perhaps to actualize its resolve to index the world’s information in a way that’s easily discoverable. Google Images update in recent weeks has seen the deployment of Tenor to improve its GIF capabilities, and Tenor is also the GIF platform that powers Gboard, Google's own keyboard. The deployment of the GIF engine on LinkedIn, gives Google another avenue to an altogether different platform to extend the variation of GIF search. And most people already use Google Images to find more information about a topic, and to help communicate and express themselves with millions of GIFs every day. As GIFs are increasingly popular in messaging apps nowadays, Tenor coming to LinkedIn is perhaps one example of how the tool is becoming almost a prerequisite for any messaging platform. Its capabilities includes ability to place sponsored GIFs inside its quick search interface, offering brands a unique opportunity to capture the attention of users as well as creating a new advertising category that could be very appealing for larger businesses. The new GIF engine is now available for about 50% of U.S. based LindedIn users, and will be rolling out globally in the coming weeks.